NC Title Seminars offered by ComSoft. Perfecting DMV Paperwork and Liens. 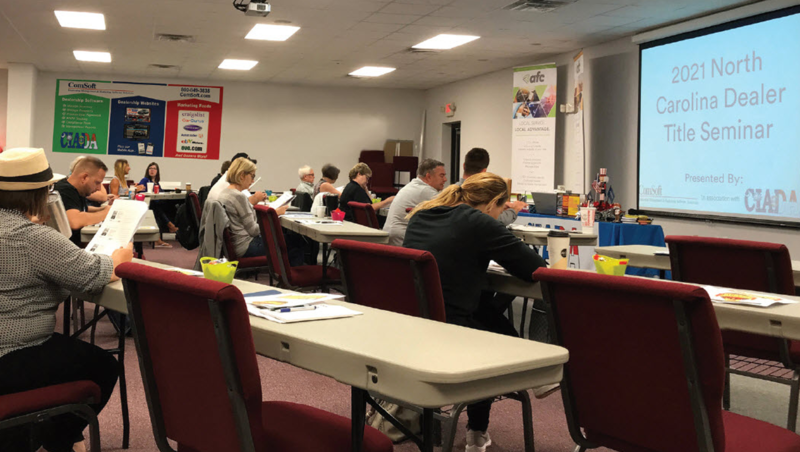 ComSoft frequently presents Titling Seminars in both Raleigh and Harrisburg, NC for dealers across the state to educate dealers of all sizes and experience to properly complete and submit DMV paperwork. We are the official Titling Seminar class of the Carolinas Independent Automobile Dealers Association (CIADA). See our Title Seminar Schedule for upcoming dates and locations. Rebecca Driver retired from the North Carolina Division of Motor Vehicles on April 1, 2017 with a little over 30 years of service. The last seven years at the NC DMV she worked as a trainer and tester with the vehicle registration section of the division. She trained new employees and license plate agencies. Her specialties in training were Title classes and For-Hire and IRP classes. When new license plate agencies opened, She attended the agency to help with any questions that arose and with paperwork. She also presented Title seminars for the CIADA and other various seminars for specialty groups such as ELT seminars and Farm Plate seminar. As a tester, she worked closely with the NC DMV Programmers on projects and changes that were Legislative mandated and DMV mandated. She tested the NC DMV STARS system before and after new changes became effective to make sure the system worked properly. A few of her major projects include: HB1779 – Collection of Vehicle Property Tax Reversal section, Electronic Lien and Titling (ELT) Program, Single Sticker, HB97 – Late Fee, First in Freedom Registration Plate and the Fee Increase change in January 2016. Along with working on the project to ensure that all laws were followed and the system worked correctly, Rebecca also provided training information for the projects. Rebecca now works with ComSoft. She trains new customers on the ComSoft MonyMaker system, answers questions from customers about the system and NC title work and promotes the software.